I was totally inspired after seeing Claire’s version on instagram @bakedeggs. Claire had seen a very similar jacket at Gorman stores and made a spectacular version of it. The fabric was a little pricey but compared to the price of the RTW jacket it was a bargain. I was originally sewing the longer version with pockets but had a major sewing disaster. After successfully sewing the pockets and lining in (and admiring my work) I was trimming away the fur seam allowance on the hem when I accidentally cut the lining about 5 cm up from the hem. It was a major disaster! I tried to repair it with interfacing and zig zagging but it looked awful. In the end, I just cut the hem shorter eliminating the cut I had made. This meant losing the pockets as they hung below the hemline. What a bummer after all that beautiful work. I love pockets in a jacket too. C’est la vie! The actual pattern is great, easy to sew and pretty straight forward instructions. Sewing with fur is not so easy. I’ve never sewn with fur before so I followed the instructions by trimming the fur down in all the seam allowances before sewing together. What a mess! Fur goes everywhere and gets on everything, even up your nose. A few lovely sewers from instagram had some great tips for sewing fur, one being to zig zag the seams rather than using a straight stitch. Another great tip which I loved, was to just sew the seams and pull out any stuck fur after. Both tips worked really well. It was a bit tedious getting all the fur out of the seams but way less messy. Sewing the lining in wasn’t the easiest job either as when you team up the lining with the fur it slips like crazy. Plenty of pins and basting is my advice. After a few hiccups I’ve ended up with a jacket that I absolutely love and have worn almost every day this winter. I highly recommend this pattern and totally recommend sewing a fur jacket! The pictures were taken at the National Theatre in St Kilda. 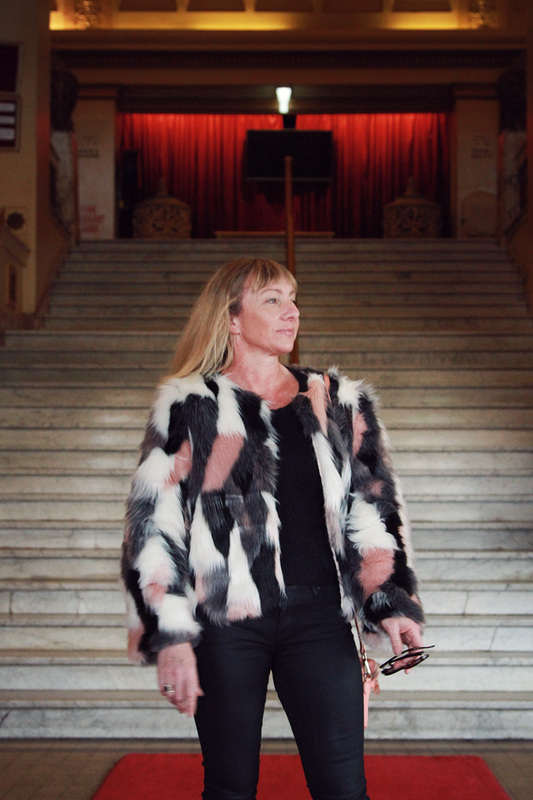 You can also see my fur jacket featured in this article from Broadsheet Melbourne. This entry was posted by Annie in DIY and tagged DIY, fur jacket, jacket, mcCalls, sew, sew this pattern, sewing. ← Meet the Stunning Sienna! My latest PDF sewing pattern. Thankyou! I’m loving it for winter. It’s so cold here in Melbourne.